The Book Chook: Let's Celebrate International Tongue Twister Day! Let's Celebrate International Tongue Twister Day! Today is International Tongue Twister Day. Tongue twisters are lots of fun. They're also a great way to get kids to practise using certain sounds in their speech. One way to celebrate would be to share Fox in Sox by Dr Seuss with your kids today, and challenge them to a "tweetle beetle puddle paddle battle" or a tongue twister contest. Here are some twisters to help you get those tongues tangled! 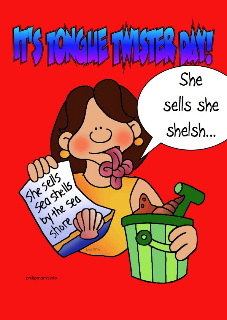 I'm sure she sells seashore seashells. A skunk sat on a stump and thunk the stump stunk, but the stump thunk the skunk stunk too. So See's saw sawed Soar's seesaw. Round and round the rugged rocks, the ragged rascal ran. And the batter was not bitter. Bought a bit of better butter. There are four fun tongue twisters on Starfall. Children can listen and read along with twisters like Peter Piper, Fuzzy Wuzzy and Woodchuck. Indian Child has many more tongue twisters for children to read. Do you have a favourite tongue twister I've missed? Image credit: poster made by Book Chook, using a Phillip Martin clipart image. International Tongue Twister Day---ooh fun! What about: Thaddeus thinks some serious threats, some serious threats thinks Thaddeus. That's a beauty, Rebecca. Thanks for sharing it! lol... I know Adelaide will love this! My challenge to Adelaide is to make a brand new tongue twister using her own name!